In summer 2009, two salvage excavations were conducted along Jaffa Street in Jerusalem (Permit No. A-5597; map ref. 2194/6328; Fig. 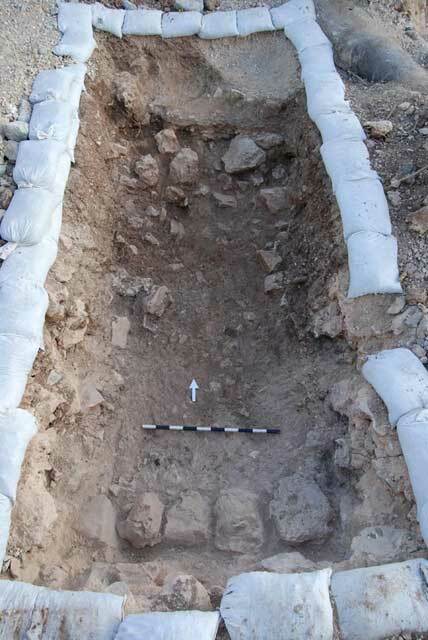 1), after ancient remains were exposed during inspection prior to construction of the Jerusalem light rail. 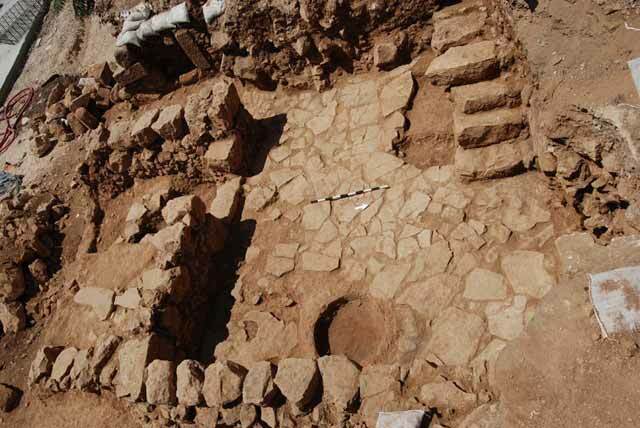 The excavation, undertaken on behalf of the Israel Antiquities Authority and financed by City Pass Corp., was directed by B. Storchan (photography), with the assistance of Y. Ohayon (administration), V. Asman and T. Kornfeld (surveying and drafting), B. Dolinka, D. Sandhaus-Re’em, S. Weksler-Bdolah and R. Rosenthal-Heginbottom (pottery), C. Hersch (drawing), Y. Gorin-Rosen (glass), L. Kupershmidt (metallurgical laboratory), D.T. Ariel (numismatics), C. Amit (studio photography) and N. Zak (plans). The first excavation (Areas E1, E2; Fig. 2) was conducted where dense concentrations of crushed ceramics and remains of a wall were discovered during the preliminary inspection. Four squares were opened in Area E1 and three squares in Area E2, revealing buildings remains. 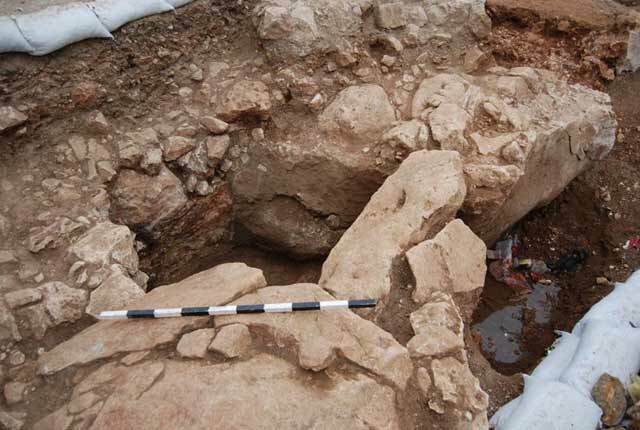 The second excavation (Area F) was conducted around a hewn water cistern, which was partially damaged by construction of the light rail. In addition, badly preserved building remains were uncovered in Area F. The remains uncovered date from the first and second centuries CE. 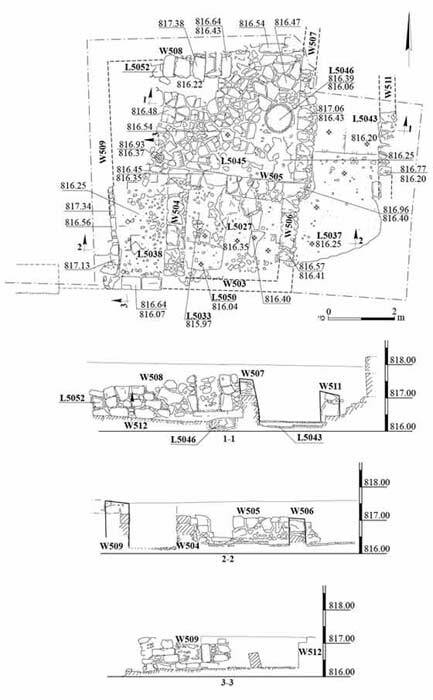 Previous excavations in the area uncovered extensive remains of large domestic structures dated to the Early Roman period (Kagan 2010 [Fig. 1: A-5726]; Vitto 2011 [Fig. 1: A-5825]; Permit Nos. A-4401, A-4862, A-4903). These structures are undoubtedly related to the large site exposed to their south, where a major ceramic production center dating from the Second Temple period and re-used by the Tenth Roman Legion was unearthed (Arubas and Goldfus 2005; Levi and Be’eri 2011). The production at the site was focused on stands and cooking pots, in addition to building materials, namely roof tiles, bricks and water pipes. The building remains were badly damaged as a result of modern construction and a wide trench dug for a water pipe (T1), which crosses the area in the middle. In the northern section of the area, a segment of an east–west wall (W500; length 3 m; Fig. 4) was found. It was built of two rows of medium-sized fieldstones set directly on the bedrock and preserved to a maximum height of two courses. The southern face of the wall was coated with a thick layer of white plaster. At the eastern extent of the wall and in direct alignment, a nicely dressed stone doorjamb with a socket was found. Based on the location of the socket on the doorjamb, it was evident that the opening faced southward. The continuation of W500, east of the doorjamb, was not preserved (L5013). South of W500, multiple superimposed layers of plaster and crushed ceramics were found (L5009; Fig. 5) on the bedrock (L5023). These layers were preserved only in small patches. The location of these layers, apparently outside the structure, may indicate that they served as a pavement, while also leveling out uneven sections of the bedrock. The layers were nearly identical in their makeup and thus indiscernible from one another. The multiple layers indicate that the pavement was resurfaced over time. Similar successions of layers of crushed ceramics were uncovered in the eastern part of Area E1 (L5026), which probably continue those found south of W500. Layers 5026 were found in association with an east–west wall (W501; Fig. 6) built of two rows of small stones. Although most of the ceramic material within these layers was crushed into very small pieces and therefore unidentifiable, the assemblage also included fragments of bowls (Fig. 7:1), basins (Fig. 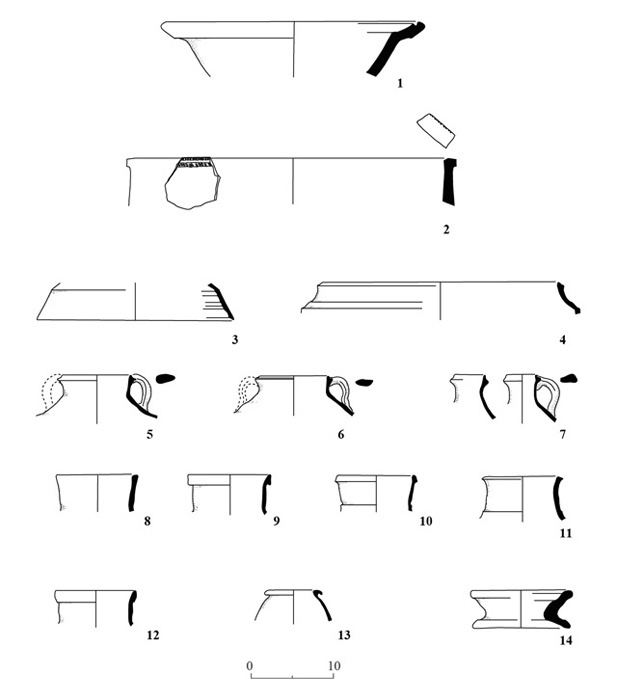 7:2), cooking lids (Fig. 7:3), cooking vessels (Fig. 7:4–7), storage jars (Fig. 7:8–12), beakers (Fig. 7:13) and stands (Fig. 7:14), dating from the first to mid-second centuries CE. The numerous stands found at the pottery workshops to the south of the excavation have been associated with the manufacturing process, yet they may have served in daily use to support round-bottomed vessels. This pottery assemblage is very similar to that revealed in Area E2 (below) and in the previously mentioned nearby excavations. Square C1, at the westernmost extent of the area, revealed the remains of an additional east–west wall (W502). Unlike the other walls, W502 was built of only one row of medium-sized fieldstones (Fig. 8). The earthen fills covering the wall were largely disturbed as a result of modern construction. Directly abutting the base of the wall was a layer of sterile reddish earth (L5014) that covered the bedrock. The wall was constructed on a much lower elevation than the rest of the remains in the area, suggesting that it belong to an occupation stratum predating the rest of the remains in the area, although no diagnostic finds come from good contexts clearly associated with the wall. 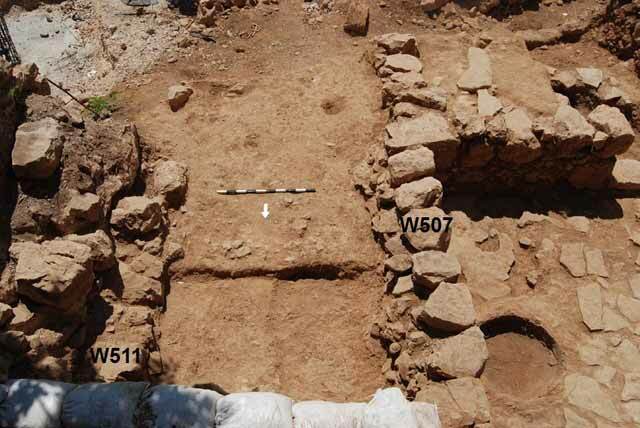 The remains of a large, well-preserved building were discovered, including an entrance corridor (L5038), a central open courtyard (L5045), a side room (L5027) and two doorways, which led to additional rooms extending beyond the excavation limits. An alleyway may have run along the east side of the building (L5037, L5043). 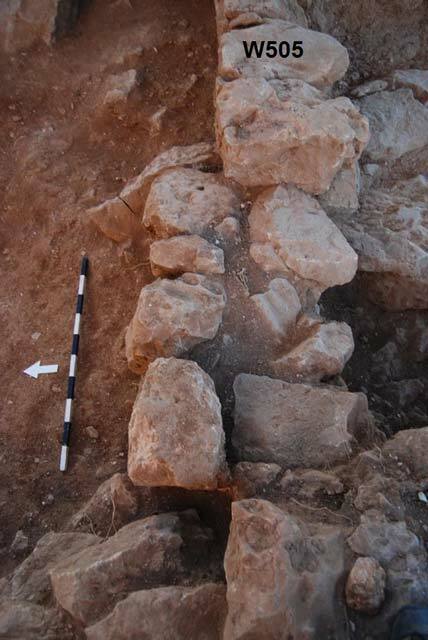 A rather dense layer of collapsed stones was discovered throughout the excavation area. Among the stones were numerous roof tiles, some bearing stamps of the Tenth Roman Legion (see below). The walls of the building were constructed of a row of semi-worked large boulders, with a flat surface facing the interior of the building, and a row of smaller stones behind them. The southern wall of the structure (W503) was badly damaged: its eastern part was completely destroyed prior to the excavation, and although its western part was not excavated, two discernible large ashlars that served as a doorjamb in the structure’s main entrance, mark its course. The Entrance Corridor. The main entranceway into the building is an elongated corridor (L5038; 1.5 × 4.0 m; Fig. 10) flanked by walls on the east (W504) and west (W509). A nicely built and well-preserved doorway was set in W509 (Fig 9: Section 3–3). It seems that this doorway led to an adjacent room located beyond the excavation limits. The doorposts were built of large ashlars, preserved up to three courses high, with a doorjamb hewn in the stone threshold. A layer of collapsed stones was exposed within the corridor. This collapse included a noticeably high proportion of well-dressed ashlars made of soft limestone. The collapse layer was found directly above a packed earth and crushed lime floor. At the northern end of the corridor, an entrance comprising a step formed by a line of flat-topped paving stones led into the courtyard. The Courtyard (L5045; 3.5 × 5.5 m) is rectangular and was paved with medium-sized flat-toped stone slabs, most of which were laid directly on the bedrock. The stone pavement was well preserved; however, large portions in the southeast corner were missing (Fig. 11). Within the courtyard, right by the entrance of the corridor, were two stone roof-rollers, one of which was standing upright on the courtyard’s pavement (Fig. 12). A bronze fibula and a basalt grinding stone (see below) were found directly on the paved floor. A circular ceramic tabun (L5046; diam. 0.8 m), full of soot and burnt debris, was found sunk into the eastern part of the floor. In the northern wall of the courtyard (W508; Fig. 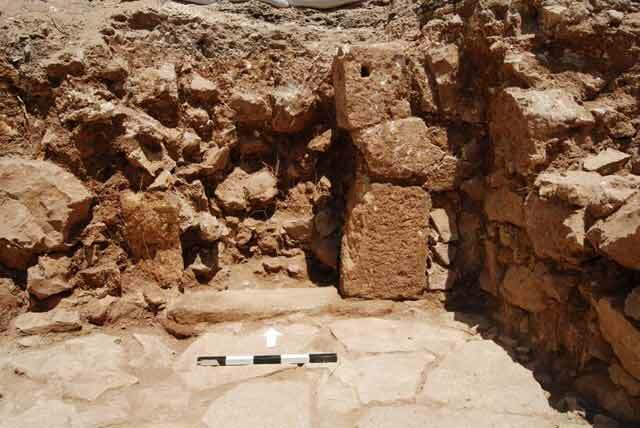 13) was a doorway leading to another room (not excavated). The doorway comprised a stone threshold and doorposts built of nicely hewn ashlar stones. To the west of the doorway and abutting the southern face of W508, remains of a staircase built upon an arch were found; four steps were preserved (Fig. 14). The staircase indicates that the structure had either a second floor or a roof that was intensively used. 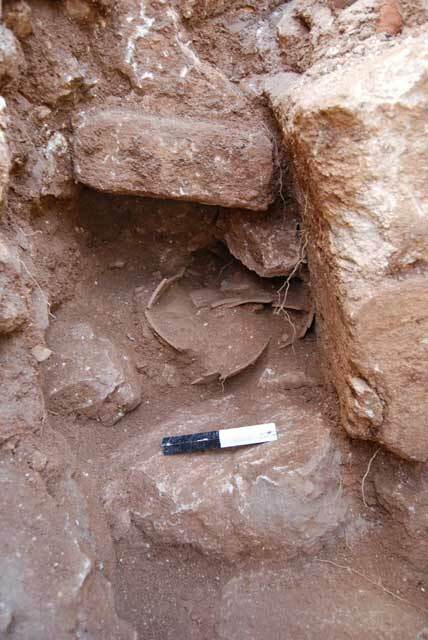 A storage niche (L5052) with a complete, in situ bag-shaped storage jar (Fig. 15; see Fig. 20:8) was found below the arch. The Side Room. A built doorway in the southern wall of the courtyard (W505), led into a rectangular room (2.5 × 3.0 m). Large stone boulders blocked the doorway in its last phase (Fig. 16). Removal of the blockage uncovered the original threshold construction. 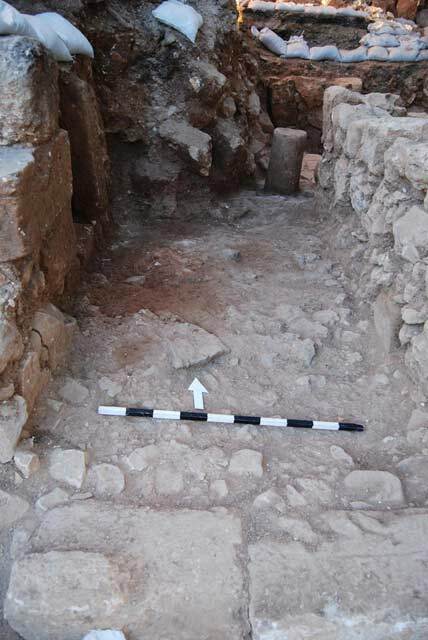 Excavation within the room uncovered a semi-paved and mostly beaten-earth floor (L5027; Fig. 17), on which lay bronze key. 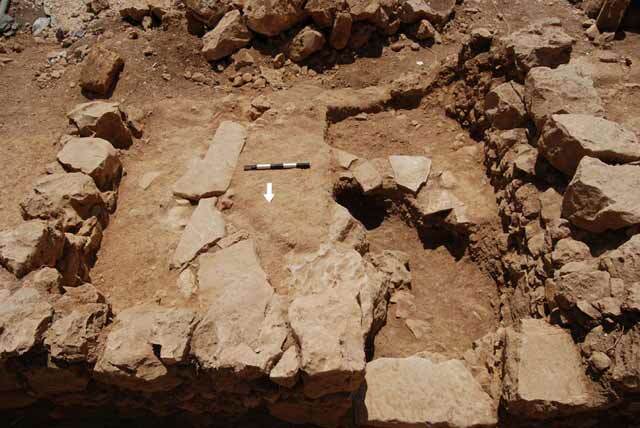 Partial removal of the floor revealed a slight depression in the bedrock (L5033, L5050) and potsherds that are almost identical to those found on the floor, and like them date the building to the first–second centuries CE. Alleyway(?). 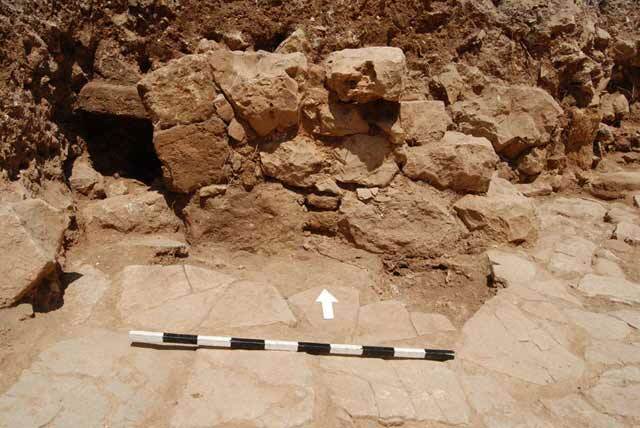 An excavation to the east of the building uncovered scant remains of a wall (W511) that ran parallel to the eastern wall of the building (W507). The construction of W511 is similar to that of the building, but no associated architectural remains were found; the wall may be part of a structure which was not exposed. Between W511 and W507, a succession of packed earth floors and associated layers of accumulated debris was uncovered (L5037, L5043), perhaps an open narrow alleyway (Fig. 18). After removal of the packed earth floor on the northern side, a fragment of a stone shekel weight dating from the Iron Age was uncovered out of context (see below). The pottery assemblage from Area E2 originated from sealed contexts, either on or below floors of the building and to its east. The assemblage comprises a variety of forms and wares dating from the first to mid-second centuries CE, which at least in its last phase was associated with the Roman Legion’s occupation of the area. The assemblage includes bowls (Fig. 19:1–4), one of which is red slipped (Fig. 19:1) and another has a shallow incised groove on the interior lip (Fig. 19:4), typical of the legionary ceramics; basins (Fig. 19:5); cooking pots (Fig. 19:6–8); cooking jugs (Fig. 19:9, 10); a lid (Fig. 19:11); a table amphora (Fig. 19:12); storage jars (Fig. 19:13–20) dating from the first–second centuries CE; beakers (Fig. 19:21); jugs (Fig. 19:22); and circular stands (Fig. 19:23). Also found were two mold-made, decorated body sherds (Fig. 19:24, 25): one is decorated with a horizontal band of a floral motif (Fig. 19:24); the other bears a design of an upward spiraling vine with depiction of a grape leaf below it (Fig. 19:25). The assemblage, largely resembling those from Area E1 and the other excavations in the immediate surroundings and contemporaneous with them, is typical of the ceramic repertoire of Jerusalem at the end of the first and the beginning of the second centuries CE. Roof tiles. 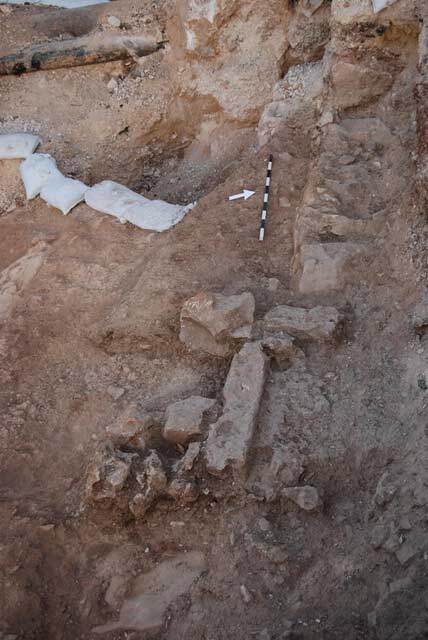 The excavation in Area E2 yielded numerous fragments of roof tiles; although found almost throughout the area, most were retrieved from the layers of collapsed stones in the courtyard. The fragments included mainly flat, lower tiles (tegula) and a few upper, curved c-shaped tiles (imbrex). Thirteen of the tegula fragments were stamped with an insignia of the Tenth Roman Legion (Fig. 20; Table 1). 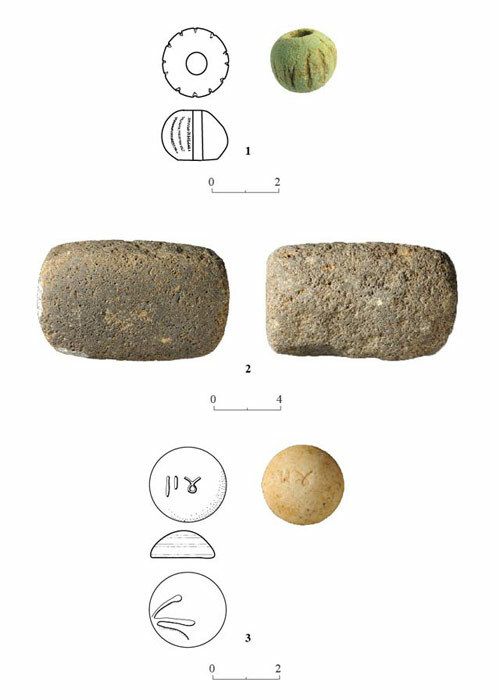 Although no stamped imbrex fragments were noticed, a few such examples are known from the Old City of Jerusalem (Geva 2003:407, Fig. 17.1:7). It thus seems that markings on tegulae were more common. The thirteen insignia exhibit two main types of stamps: a round stamp depicting a warship above a lettered abbreviation and a boar below it (Fig. 20:1–5; Barag 1967: Type I); and a rectangular stamp with a large or small lettered abbreviation (Fig. 20:6–13; Barag 1967: Type II). Barag suggested that the Type I round-stamps should be dated to 70–130 CE, and probably pre-date the rectangular stamps. According to Geva, the majority of the legionary building materials were produced during the second century CE (Geva 2003:412). The rectangular stamps contain examples of four varieties, namely Barag’s Type II Variants B, C, E and G, of which Variant E (LEG·X·F) is the most common. One of the stamped tile fragments features five circular depressions (Fig. 20:12). Similar depressions were found on a stamped tile from an excavation to the south and on an unstamped tile from City of David (Geva 2003:413, Photo 17.1). The impressions have been interpreted as the imprint of a legionary sandal. In the southeastern edge of the area, partial remains of an irregular water cistern (L6047; excavated depth 1 m; Fig. 22), set into a natural depression in the bedrock, were uncovered. The cistern was partially built of medium-sized fieldstones and coated with plaster. It was filled with soil saturated with water, and therefore the excavation did not reach its floor. 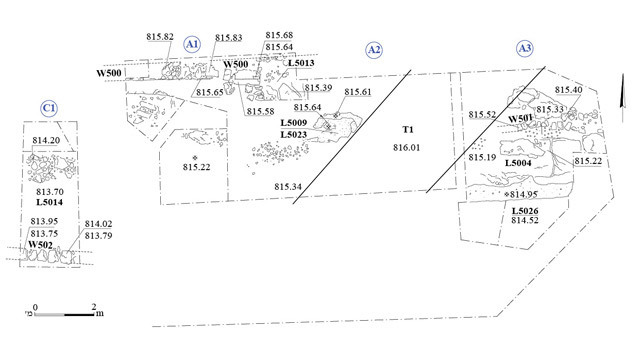 In the northern part of the area, two badly preserved walls (W600, W601; Fig. 23) forming a corner were found. The walls were built of a single row of large boulders. A layer of crushed ceramics, resembling those unearthed in Area E1, abutted the inner corner of the walls. The diagnostic pottery found within the cistern and in the layers of crushed ceramics date from the first–second centuries CE. The assemblage resembles the forms and vessel types found in Areas E1 and E2, and is contemporaneous with them. Although the remains in Area F were badly preserved and extremely limited in scope, they are of major importance as they represent the westernmost settlement remains of this site unearthed so far. The metal finds from Areas E1 and E2 are made of bronze, iron and lead. These were mostly small, badly corroded fragments; only seven objects were identifiable (Fig. 24). The finds from Area E1 include a triangular iron plate (Fig. 24:1) and a complete iron chisel (Fig. 24:2), both found in the layers of crushed ceramics, and half of an iron horseshoe (Fig. 24:3), with two complete perforations for nails, found in an un-stratified earthen fill above W502. 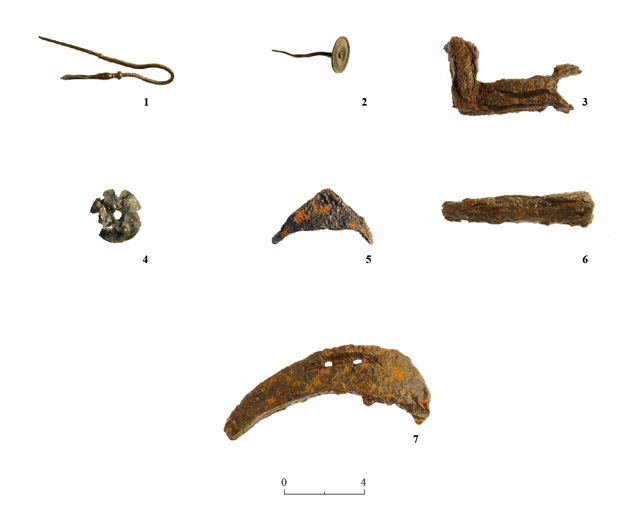 Those from Area E2 include a complete bronze fibula (Fig. 24:4), uncovered directly above the stone pavement of the courtyard; a complete bronze nail (Fig. 24:5)—an elongated thin shaft, circular in section, with a well-finished, decorative thin, flat head, which was probably used for furniture—found above the floor in Room 5027; a fragment of a heavily corroded bronze key (Fig. 24:6) from under the floor makeup in Room 5027; and a round bronze perforated disc, conical in section (Fig. 24:7), found among the stones of W505. The excavation revealed 23 identifiable coins (Table 2), ten of which were of Agrippa I. The glass vessels from Areas E1, E2 and F, although badly preserved, comprise types which were common from the end of the first century to mid-second century CE. Comparable vessels were found in the Judean desert caves, in Jerusalem and at most of the sites in the region dated to the Bar Kokhba Revolt (Katsnelson 2007). The assemblage includes bowls with out-folded hollow rims and bowls with a double fold below the rim, where it connects to the body, of two sub-types: one characterized by a thin wall and flaring, shelf-like rim with a double fold; and the other is thicker, with a double fold in the wall. One notable fragment bears the remains of an applied tooled trail on the rim’s edge, which belongs to a group of bowls with crimped trails on the rims. These types of bowls generally have ring bases; one such base was found in the excavation. A few fragments belong to candlestick-type bottles, including one with an infolded rim and several neck and body fragments. Also noted among the diagnostic fragments, was a handle attached to both the rim and neck of an aryballos-type vessel, typical of the Roman period. All these vessels have parallels in glass assemblages in Judea, dated to the period between the two Jewish Revolts (70–135 CE; Katsnelson 2007). 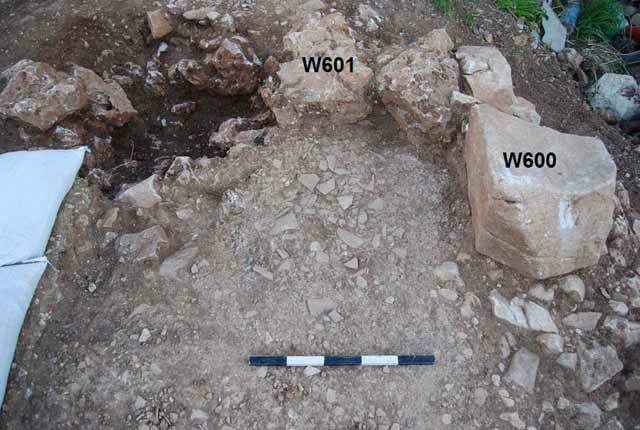 A few stone artifacts made of local limestone, basalt or faience were uncovered in Area E2. The following items were found directly above the stone-paved floor of the courtyard: a green-colored, melon-shaped faience bead (Fig. 25:1), a basalt grinding stone (Fig. 25:2) and two complete roof-rollers (see Fig. 12). The basalt grinder bears a single smoothed surface created by repetitive use. East of the courtyard, between W507 and W511, within the lowest packed earth floor (L5043), was an upper, domed-shaped part of a two-shekel stone weight from the Iron Age (Fig. 25:3). A similar, complete, stone weight was found in an excavation south of the area. Since only a single pottery shred from Area E1 was dated to the Iron Age, it seems that the weight was intentionally truncated to be reused in a later period. 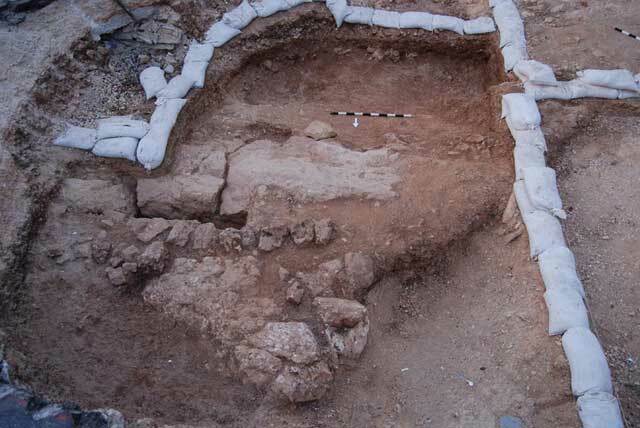 The earliest remains uncovered at the site can be dated to the Iron Age. Nearly all the excavations conducted along Jaffa Street and at the adjacent Convention Center uncovered pottery from this period. The nature of the Iron Age settlement is still largely unknown due to the lack of clear archaeological contexts and architectural remains. 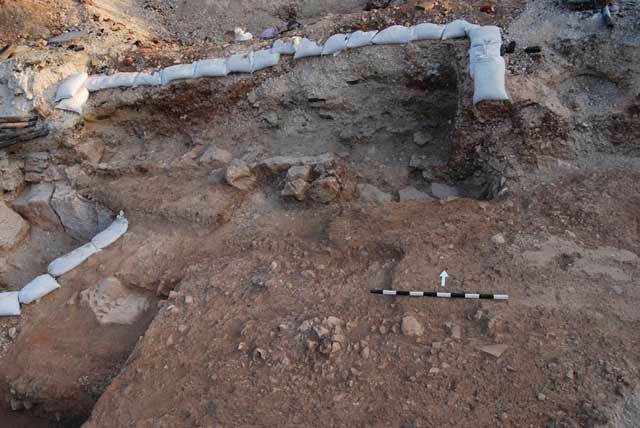 The settlement at the site seems to have reached its apex during the last part of the Early Roman period (Levi and Be’eri 2017); the remains uncovered in the current excavations are part of this larger site, which extended southward, as revealed in the Convention Center excavations. Whereas the southern excavations uncovered an extensive industrial area allotted for ceramics production, the northern part of the site seems to have been more domestic in nature. The current excavations indicate that the northern domestic area was probably erected during the Second Temple Period, and was reused at a later phase, when the Roman army took over. The link between the two areas is attested by the similar pottery assemblages found in both areas and by similar layers of crushed ceramics. These layers found in all the excavation areas, as well as in other excavations along Jaffa Street, may contain fragments of wasters from the pottery workshops, as production waste was reused as a form of pavement. Arubas B. and Goldfus H. eds. 2005. 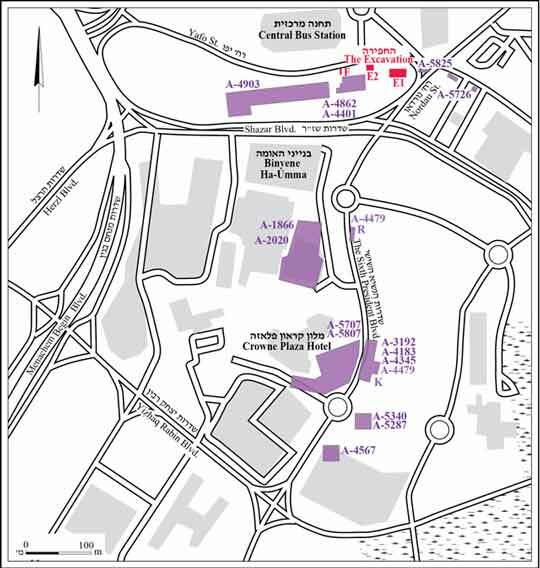 Excavations on the Site of the Jerusalem International Convention Center (Binyanei Ha’Uma): A Settlement of the Late First to Second Temple Period, the Tenth Legion’s Kilnworks, and a Byzantine Monastic Complex; The Pottery and Other Small Finds (JRA Suppl. S. 60). Portsmouth, R.I.
Barag D. 1967. Brick Stamp Impressions of the Legio X Fretensis. BJ 167:244–267. Geva H. 2003. Stamp Impressions of the Legio X Fretensis. In H. Geva ed. 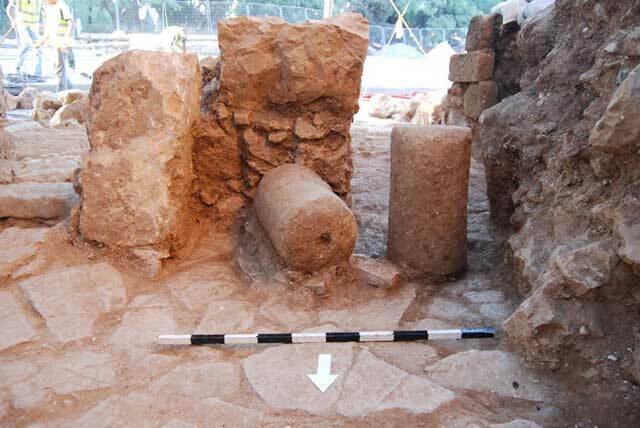 Jewish Quarter Excavations in the Old City of Jerusalem II: The finds from Areas A, W and X-2. Jerusalem. Pp. 405–422. Kagan E.D. 2010. Jerusalem, Binyanē Ha-’Umma. HA-ESI 122. Katsnelson N. 2007. Early Roman Glass Vessels from Judea—Locally Produced Glass? Preliminary Report. In J. Patrich and D. Amit eds. New Studies in the Archaeology of Jerusalem and its Region: Collected Papers 1. Jerusalem. Pp. 5*–11*. Levi D. and Be’eri R. 2011. Jerusalem, Binyanē Ha-’Umma. HA-ESI 123. Levi D. and Be’eri R. 2017. The Potter’s Workshops at Binyanē Ha-‘Umma as a Tool for Understanding Historical and Cultural Changes in Jerusalem from the Second Century BCE to the Second Century CE. In Y. Gadot, Y. Zelinger, K. Cytryn-Silverman and J. Uziel eds. New Studies in the Archaeology of Jerusalem and its Region: Collected Papers 11. Jerusalem. Pp. 124–143 (Hebrew). RPC II: A. Burnett, M. Amandry and I. Carradice. Roman Provincial Coinage II: From Vespasian to Domitian (AD 69–96) (2 vols.). London 1999. TJC:Y. Meshorer. A Treasury of Jewish Coins from the Persian Period to Bar Kokhba (R. Amoils, trnasl.). Jerusalem–Nyack, N.Y. 2001. Vitto F. 2011. Jerusalem, Max Nordau Junction. HA-ESI 123. 4. Wall 500, looking west. 5. Plaster and layers of crushed ceramics (L5009), looking north. 6. Wall 501 and associated ceramic layers, looking south. 7. Pottery from Area E1. 8. Wall 502, looking north. 9. Area E2, plan and sections. 10. Entrance corridor, looking north. 11. Stone pavement in the courtyard, looking west. 12. Two in situ stone roof-rollers, looking south. 13. Entranceway in Wall 508, looking north. 14. The staircase in the courtyard, looking north. 15. The storage niche with an in situ storage jar, looking north. 16. Blocked entranceway in wall 505, looking east. 17. The side room, looking south. 18. The area between W511 and W507, looking south. 19. Pottery from Area E2. 22. Water cistern, looking northeast. 23. Walls 600 and 601 and the layer of ceramics abutting them, looking north.